Deloitte today released the 2016 Technology Fast 500, an annual ranking of the fastest growing North American companies in the technology, media, telecommunications, life sciences, and energy tech sectors. In the 2016 rankings, 68 percent of the companies were backed by venture capitalists at some point in their company history. Additionally, software companies led the way for the technology sector with 58 percent of the entire list and of private companies, 44 percent were software as a service (Saas) companies. Since the creation of the ranking (21 years), each year software companies have made up the majority of winners, with a median growth rate of 275 percent this year. 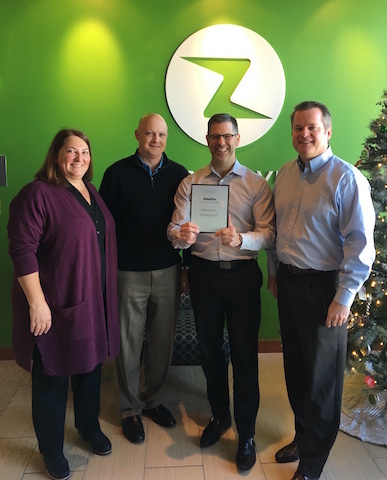 In addition to Zapproved, six Portland-based companies were recognized on Deloitte’s Technology Fast 500™: Act-On Software, Cedexis, ID Experts, Semler Scientific and Vacasa. Awardees are selected for this honor based on percentage fiscal year revenue growth from 2012 to 2015. Overall, 2016 Technology Fast 500 companies achieved revenue growth ranging from 121 percent to 66,661 percent in the period from 2012 to 2015, with a median growth of 290 percent. See the complete 2016 Technology Fast 500 list of winners.